Bitcoin took a considerable hit over the last 24-hrs resulting in a pullback for all of the top cryptocurrencies. Looking at the chart there is hope for the bulls. 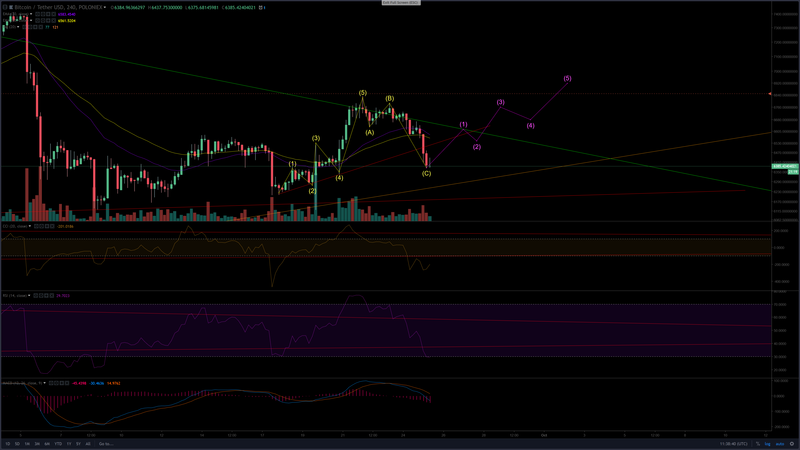 The 4-HR RSI is indicating oversold conditions for BTC and we can see that the RSI is beginning to curl upward. This is likely to indicate that a relief rally is in the making. In addition to that we can see that volume is also in favor of buyers and that over the last 12 hours seller volume decreased. Miners are looking for Bitcoin to remain over $6000 to continue making profits for their efforts. A drop below this price for an extended period of time would be bad for their bottom line, let's keep that in mind. On the more technical side of things. We can see that BTC has waves that we can count. There is an impulse up leading to the long-term resistance line followed by a corrective ABC wave. It is logical to assume that current pricing is the bottom of the corrective C wave and that an impulse wave up is due. Additionally, Bitcoin is near a long-term support line at these current prices that has been well defended by the bulls in the past. If Bitcoin does move up in an impulse wave this is likely the time that the long-term resistance is broken and Bitcoin will begin a new uptrend long-term. On the bearish side a further move down is likely to lead to $5800 where the bulls will attempt to mount a heavy defense.